« Is “Third Order” Membership Risky? Oh, my very favourite sacramental! Happy feast day to everyone! I went to a school serviced by the Vincentian Fathers who fostered in me a great devotion to the Miraculous Medal. When I was 15 years old, I first visited the Rue du Bac and was captivated by the chair on which Our Lady had sat whilst speaking with St. Catherine Laboure. I still visit the church every time I’m in Paris and the first effect has never worn off. All my children wear the medal, as do my husband and I, and I carry spare ones to distribute when I deem it fit. I also secrete medals in hidden places when I think Divine intercession is required. That’s all lovely; I especially like your idea of placing medals where you think “Divine intercession is required” – beautiful. I’m sure that’s won many graces for people in need, not least spiritual need. I am also a devotee of the miraculous medal, but it amazes me how many Catholics do not bother about them. I can’t tell you how often I’ve thanked my medal for saving me from an accident for example. The medal is very powerful – maybe we should remind our friends of how it got its name, just by actually working miracles! I’ve also done that – secreted a medal in a hidden place for a special intention. It does work! I find that more Catholics now say the Breviary, rather than the rosary or wear sacramentals. I feel guilty saying this, but I don’t approve of that. It was also the priests and religious who said the Breviary, the laity did not. Now, since Vatican II, we’re all priests, so the Catholic devotions get pushed aside and we all say the Breviary. I love the Miraculous Medal and can’t remember half the stories I’ve heard about it. I do know that I’ve used it to gain favours, and they have been granted, especially one big one, so I’m a real fan, LOL! Sorry, “also the priests and religious” should be “always”. One of our parishioners also secreted medals, this summer, around the Rectory and the Church, as we are under constant attack from the LGBT brown shirts in the town. Could be one reason why we achieved a smashing electoral victory in the recent City Council election! Thank you for that. I was brought up in the parish of St Catherine Laboure in the north of Glasgow so I have a special interest in her life story. I took a look inside the Kindle version and I have resolved to purchase a hard copy asap. For now, I’d like to ask everyone to remember a very special intention in prayer today. I’ll be meeting some new people, although not in any “religious” context, and will be looking for ways to give them miraculous medals. Please pray for the success of this little enterprise. Thank you. Done and dusted! Many thanks for that. I’ve just received an assurance by email that my request for prayers for graces for all those encountered today, will be honoured. Thank you again! It’s odd that St Catherine Laboure prophesied that Paris would be in flames (I can’t recall whether Our Lady said this to her, or if she had a vision of it) but the same thing is happening again, today . . . like any country, until France returns to God and the Catholic Faith, it will continue to suffer. I would recommend checking your Miraculous Medals, dear folks. The old ‘hand-shakers’ have been making blasphemous versions by replacing the 12th star from Our Lady’s crown with a masonic compass! I have an image I would post here if I had the know-how, I shall e-mail to editor and ask her to kindly oblige. I found it in images when I Googled – I presume this is it? That is scandalous! I’ve never heard of that before, how dare those Masons do something like that – it’s downright evil. WOW! You gave me a good scare! I just took off my Miraculous Medal just to check. Thank goodness it’s not there. (I also got mine from the Benedictines in NM, USA (they’re affiliated with the SSPX). I’m having email problems today, so can’t respond to your request – but I guess the others, have now posted what you sent me. Shocking stuff. Thank you for that alert. I’d never heard of the Masonic version of the Miraculous Medal. Disgraceful. 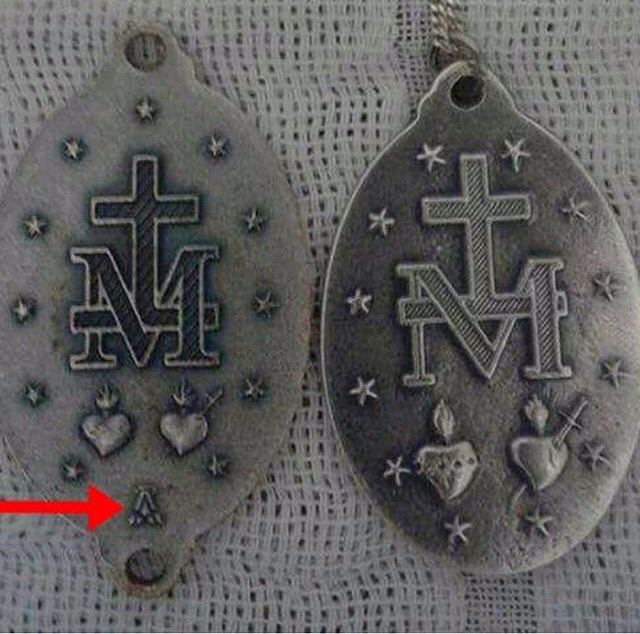 There have been several corrupted versions of Miraculous Medals for sale over the years. Just inspect them closely before buying /accepting them. Any strange marks, then leave well alone. I was unable to access the website you refer to, but, found another site with the same information. It is miraculous that Our Lady appeared to both Saints Catherine Laboure and Bernadette, their bodies are incorrupt. I’m a great believer in the miraculous medal. I’ve given one out today, to a young man who is a lapsed Catholic, please pray for him! A very happy Feast of the Miraculous Medal to everyone here. I am a strong believer in sacramentals, especially the brown scapular and the miraculous medal. If you don’t wear one, I recommend that you start as soon as possible. A happy Feast of the Miraculous Medal, with prayers for Our Lady’s intercession for the bloggers here. Also, prayers for the intercession of the great Saint Catherine Laboure, a most humble and self-effacing saint. Many thanks to all who contributed to this thread. It’s been four years since we ran a discussion on the Miraculous Medal so this one is long overdue! I didn’t manage to give any medals out today, after all, but I am sure there was grace available in those secular conversations, so thank you to all who kept that intention in your prayers. Will close this thread tomorrow morning – but, again, thank you to those who have contributed so far. I’m glad I caught this thread before it closed. I haven’t had much time to post over the last 36 hours, but I have read all the comments. I’ve only started wearing the Miraculous Medal recently. It’s a Sacramental I’ve never been particularly attached to until recently. However, I’ve made it my business to learn more about to carry some around with me. This thread came at the right time for me and I thank those who suggested some good books on the medal. I’ll now close this discussion, repeating my gratitude to all who contributed to this thread in honour of Our Lady’s Miraculous Medal and the lovely Saint, Catherine Laboure.